Lost in the timestream, several New Mutants were stranded in an alternate future not unlike the Days of Future Past, where most X-Men and New Mutants had been killed by Sentinels. One of the few survivors was an older Cannonball, who, alongside an embittered Dani Moonstar, was trying to free his lover, Lila Cheney, from the Sentinels, as Lila was needed to evacuate the few remaining mutants off-planet. 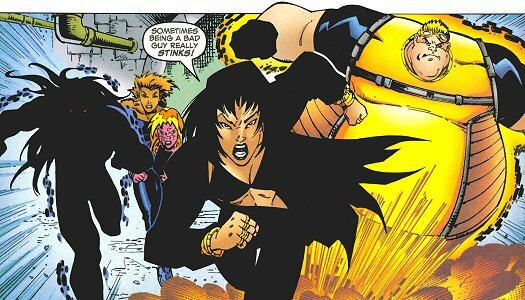 In the timeline depicted in What if (2nd series) #12, several members of the X-Men and New Mutants, Sam among them, chose to accept Loki’s offer and stay in Asgard. Sam married Kindra, daughter of the Dwarf King Eitri, and, after Etri’s death on the battlefield, he succeeded him as king of the dwarves. Sam was the first dwarf king to create lasting peace between the dwarf kingdom and Asgard. Around the same time, his wife even became pregnant with his child. 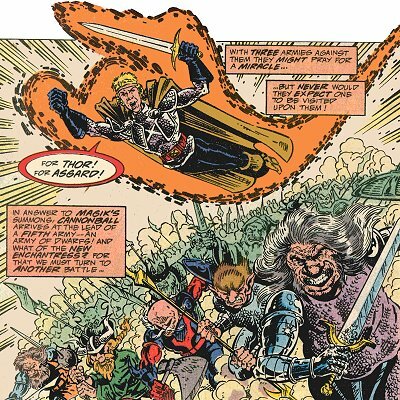 Ten years after X-Force helped him overthrow the Mojoverse and place Shatterstar on the throne, Arize returned to Westchester and sought their help once again, this time in undoing what they had done previously. 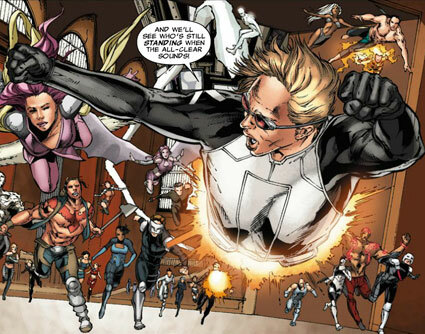 As shown during the Shattershot crossover, Arize found a new squad of militant mutants – among them Sunspot, Darkchylde, Powerpax, Siryn and Cyberlock - with Cannonball acting as leader in the deceased Cable's stead. 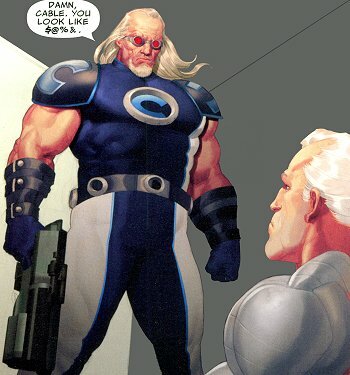 This future's Sam Guthrie possessed the strict militaristic leadership style of his former mentor Cable, as well as the adherence to justice and equality he learned from his first mentor, Charles Xavier. He sported a crew cut, and his costume mixed elements from his New Mutants graduation costume and the one he wore when he first joined X-Force. Cannonball of the Age of Apocalypse had to deal with a rather harsh upbringing. 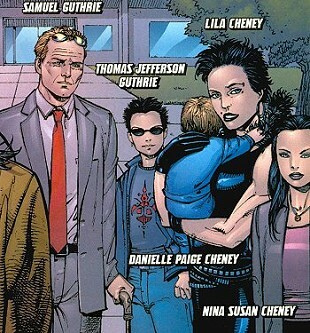 At one point, the Guthrie family was found and culled by Apocalypse’s troops, like millions of other people in the midwestern area of the United States. Only the siblings with apparent mutant traits survived. 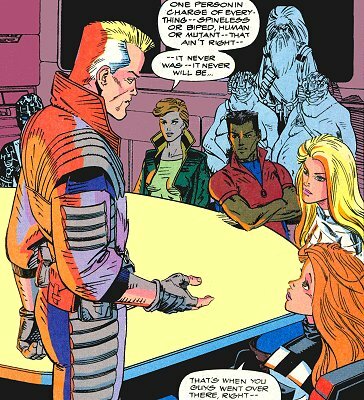 While Paige Guthrie joined the resistance under Magneto’s leadership, Cannonball and their other sister, Elizabeth, chose to serve Sinister and became rather arrogant and cruel. As part of the Mutant Elite Force, it was their duty to monitor the breeding pens and to track down any inmates who were trying to escape. Sam had a black tattoo across his eyes, not unlike the one Havok wore. When Havok openly rebelled against their superior, Cyclops, both Cannonball and Amazon sided with him. Later, after Apocalypse’s rule ended, the Guthries continued to serve Sinister. They were killed by Magneto when they tried to kidnap his son, Charles, for their employer. for being fat. Due to his increased weight, Sam couldn’t stay aloft for too long. As the Marauders had botched a job for their mysterious employer, they escaped into the Morlock tunnels, fearing his wrath. Their final fate remained unclear. Ten to fifteen years in a possible future, the X-Men met their End when several of their deadliest opponents banded together and attacked them on various fronts. By then, Cannonball was no longer an active member of the team, apparently having been crippled in an earlier battle as he needed to support himself with a cane. Sam was only seen briefly alongside Lila Cheney and three children. Although not explicitly stated, presumably Sam and Lila were partnered, and sired the three children together. In the year 2043, an aged version of Cannonball with long grey hair sought out the time-traveling Cable and the mutant messiah baby. He wore a smaller pair of blast-goggles and carried a grenade launcher. Additionally, he had bulked up quite a bit, but still made use of a costume that resembles his current X-Men attire. This older Sam defended Cable and the baby in his care against their pursuer, the murderous Bishop. 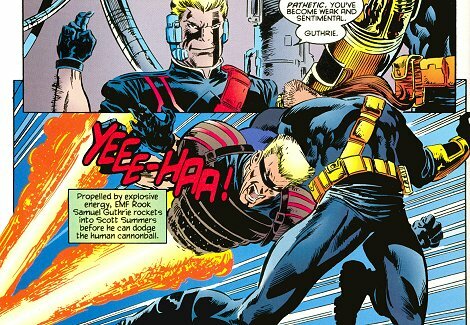 In order for them to escape, Cannonball created a diversion, but Bishop caught him off guard and used his advanced machinery to rip out Sam’s heart. 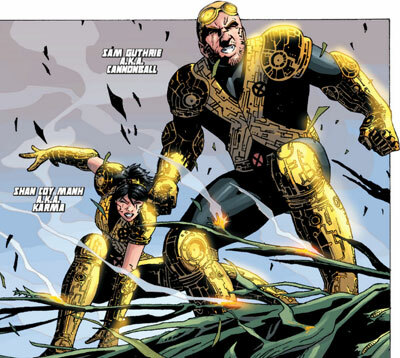 In Legion’s Age of X reality, Cannonball was the primary field leader of the surviving mutants at Fortress X, the last remaining stronghold for mutantkind, outranking even that reality’s Cyclops. More obedient than his 616-counterpart, Cannonball adhered to orders so strictly that he failed to acknowledge how many aspects of the world he inhabited didn’t make practical sense. In the end, this refusal to question authority cost him the respect of the very mutants he was supposed to lead. When an arcane, extra-dimensional alien imprinted on Cypher’s brain, he infected the rest of the New Mutants with the Transmode Virus and made them, and the whole world, into his servants. The Cannonball and Karma of this Fear the Future timeline managed to resist, however, and devised a way to travel back in time to prevent Cypher’s initial corruption. The Transmode Virus was integrated into this Cannonball’s body and uniform, making it possible for Cypher to assume control of him from the future. He returned to his timeline shortly before the New Mutants prevented it from ever coming to pass.